By Mustaza Mustafa in Desktop. Updated on April 17, 2019 . The new Windows 8 consumer preview is gaining wide attention over the Net and in mainstream media, to some praise and, to a wider extent, criticism of the drastic change that is the Metro Start Page. Suffice to say that the changes were made to allow Windows to associate itself with a more tablet-friendly environment, making all apps and programs readily accessible from the get-go. If you are using windows 8 on your tablet, this quicktip will show you the swiping motions you need to get around and about on Windows 8’s latest interface. 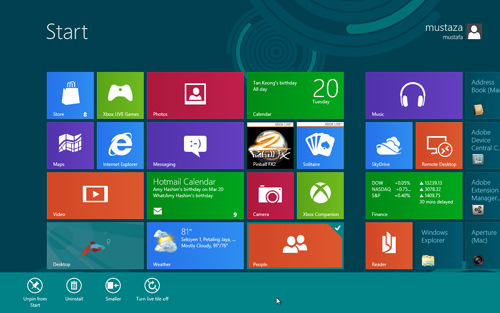 Access to the features Windows 8 has to offer is made easy with a few swiping motions in the right direction. This will open an options panel with shortcuts to Apps, Settings, Start page. If you are holding a tablet, use your right thumb to touch the window’s edge on the right, and swipe gently towards the inner screen. 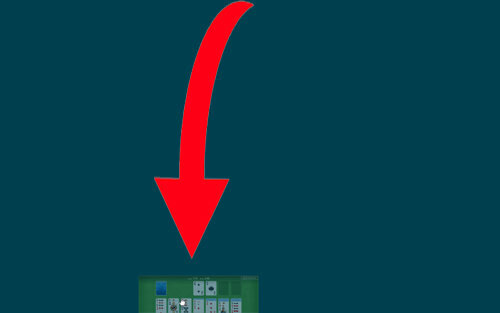 A menu bar will appear on the right, and a clock will display at the bottom left of the screen. On the Menu bar, you will see Search, Share, Start, Devices and Settings icons. These options are reachable from all page and app screens. This action lets you switch apps, if you happen to have more than one app open at any point in time. The motion is similar like the above, but you do it from the left of the screen. Simply swipe from the left to the inner screen to switch between applications. Swipe slow: When you need to compare two windows in one screen but don’t want to minimize the windows, all you need to do is swipe slow from the left to have the view of both screens. Each will cover half of the same screen, and you can select which window you want to continue looking in detail. Swipe slow and pull: If you have 5 applications run at the same time, and you want to preview and select an application from the five to use, simply swipe-slow from the left screen and pull-back. A left bar will appear showing all active applications. 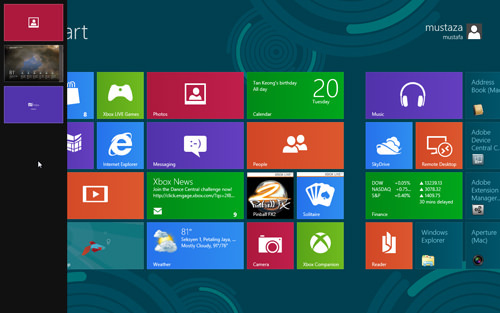 Every tile on your Windows 8 metro start screen is customizable. Swipe down on the tile to unpin it from the start screen, uninstall the app or change the tile size i.e. from rectangle to square or vice versa. 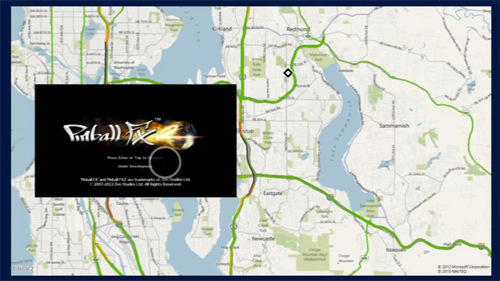 Swipe can also bring you extra options on the pages you look at on your Internet Explorer browser. When you are on Internet Explorer, swipe down gently from the top of the screen to see available/opened tabs so you can switch tabs. 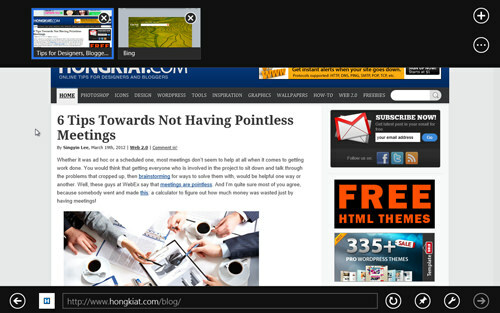 This feature makes browsing on your Windows 8 simpler on a tablet. To move backwards and forwards through the pages, you can swipe from left to right, or right to left. 1. On the tablet, you can pull down from the top of the screen to close an app. 2. Hold-drag a tile on the start screen to swap positions. 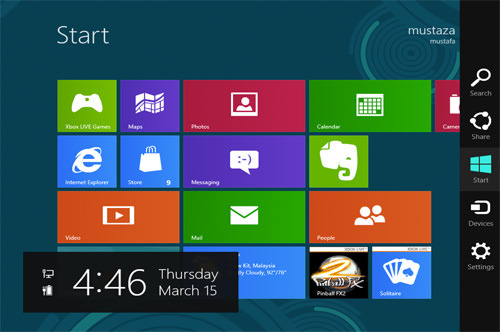 Your start screen is your home screen and you have the ability to customize the position of every tile placed there. To swap tile positions, hold a tile and drag it to its new position. If you are familiar with the new Windows 7 phone, then the Windows 8 Metro page may not be new to you. The swiping feature definitely adds extra points for ease of use. But don’t take our word for it, try it out on your own.